I'm already starting to make use of some of the stash that I've just received from that lovely freecycler I mentioned in my last post. This weekend was spent playing with some of the purple wool and it feels great to be using something other than green! 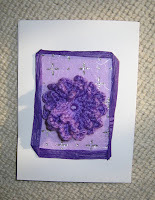 First off I wanted to make a simple card up to say thank you for all the wool and using the pattern for a small chrysanthemum from my Crochet inspiration book to make up the main motif it only took another 10 minutes before I had a pretty card to send. 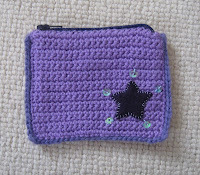 Next I decided to do another bit of Birthday crafting and make up one of my simple purses, but this time in purple. With a matching zip and little felt star (and a few sequins for a bit of sparkle) the purse looks so sweet and is just the right size for getting a few credit cards, coins and notes in. More Birthday crafting will probably follow shortly... I also have high hopes of doing some early Christmas crafting very soon to try and get a good few presents made up before I go into baby panic.